I love to be with you. I love to talk with you, to pray with you, to sit beside fires with you, to go on adventures. I love to work with you and serve with you and go out on the town with you. Make no mistake. I LOVE to be with you. Being with people too much makes me so tired I feel like I might die. People are often astonished to learn that I am an introvert, because I can really work a room. I can meet and greet with the best of ’em. 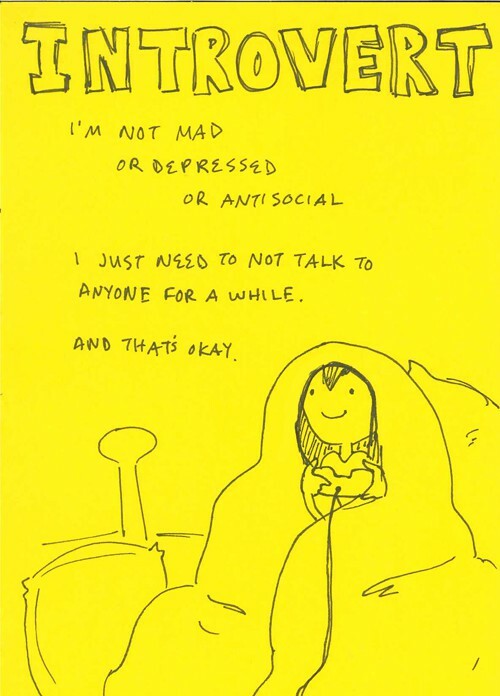 I think of myself as a conflicted introvert. That means I get myself into exhaustion trouble a lot because I don’t make space for recovery time. Because I would rather be with you than miss out on fun. You see my dilemma? Complicating things further is the fact that my husband is “king of all extroverts”. He gets energy from you and after a party he is so wired he can’t sleep for hours and I can barely make it home conscious. From what I have been able to learn so far about myself is that for every hour of socializing I need at least two staring at a book, the tv, my journal, or a wall. If I don’t get that I turn into a dreadfully unpleasant person. It is like clock work. I was very surprised to learn that 57% of people who access my blog from facebook are under 35. Surprised because I mostly write about being a wife, mamma and other grown up things. But anyways…now that I know you are here…please take this quiz, read this book, or this book. I lived huge chunks of my life living oppositional to my nature and it cost me big. I want you to know what you need to thrive, and it is going to look different from everyone else..maybe even your future spouse. Is your lifestyle draining all your energy or giving you life? I really hope you find out before your thirtieth birthday. So anyways…all this to tell you…I will not be answering the phone tomorrow. Not once. I will be in my garden picking winter squash. I will be in the forest listening to wind whistle. E and I might hit the books really hard…beautiful ones. We will likely paint and I might just stare at a wall. Also? I can’t wait to see you this weekend. You have to read it, you will make no more excuses for how you were created! !